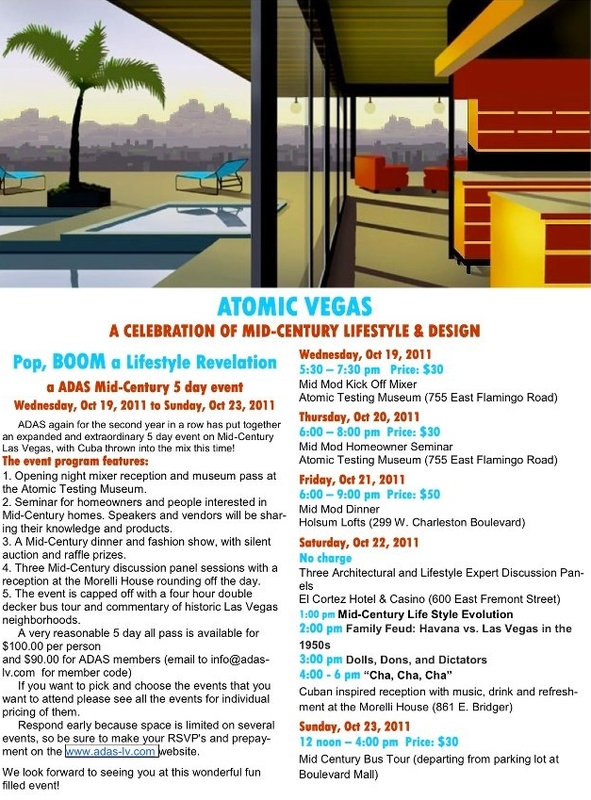 There’s still limited tickets available for the remaining events of the Las Vegas Mid Century Modern Weekend. This year, the weekend is called “POP, BOOM – A LIFESTYLE REVOLUTION”. It’s being put on by ADAS the Architectural and Decorative Arts Society of Las Vegas. I will be personally conducting and narrating the Mid Century Modern BUS TOUR on Sunday Afternoon, and I’d love for you to go with us. This year – we’ll be touring thru the historic Mid Century Modern Neighborhoods of Las Vegas. Tickets for the bus tour are $30.00 and you can get yours at the ADAS-LV website. Saturday’s panel discussions and the Cuban inspired reception at the MORELLI HOUSE are FREE and are co-sponsored by the Vegas Valley Book Festival. Again – TICKETS ARE AVAILABLE AT THE ADAS WEBSITE – ORDER YOUR TICKETS NOW! Last year the bus tour sold out on the day before the tour. Below is the agenda of the remaining events that start tonight.